Markers 4 U, Inc., knows about all kind of markers, from permanent marker pens to industrial paint markers. 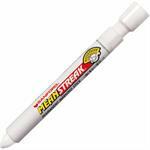 When you are seeking a dependable marker for your business, a Mean Streak Marker might be the selection you need. These high-end Sanford markers are perfect for heavy industrial use. This means that they have no problem laying down thick, solid lines on rubber, concrete, metal, and a variety of other surfaces. Furthermore, the marks won’t chip, fade, or peel. When you place an order for these permanent marker pens from our business, you’ll receive discounts when you order high quantities. The more your order, the cheaper the markers! Review the selection of Sanford Markers we have available and place your order with us. Whether you are ordering just one Mean Streak Marker or are interested in placing an order for a variety of markers, you’ll have no problem finding the selection you need at the right price.